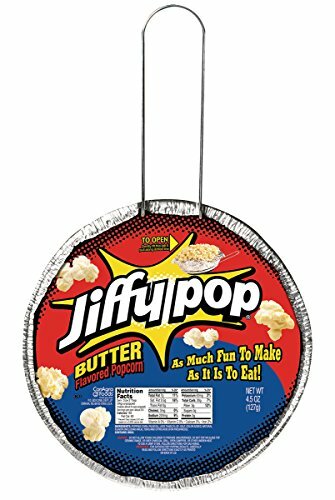 Jiffy Pop Butter Popcorn, 4.5 Ounce -- 12 per case. With a self-contained stovetop popping pan, JIFFY POP is just as much fun to make as it is to eat. Purchase a 24-pack of JIFFY POP Butter-Flavored Popcorn for that fresh, homemade taste and stove-popping experience that brings everyone together. Made using the finest corn kernels, JIFFY POP creates the ultimate popping experience for your family movie nights or camping trips. Quickly prepare on a gas range, electric range or camp stove by placing on the burner and shaking back and forth until foil is fully expanded, approximately 2 to 5 minutes. Choose JIFFY POP for a fun snack that's ready in a jiff.